You start with a small farmyard and one villager of each of the five professions: abbot, councilman, traveller, craftsman and merchant. You improve your village by adding buildings and fields, pushing on with your travels and attracting customers and monks, all the while time ticks steadily away. Every now and then a villager passes away, leaving his profession unoccupied. And even though you can train a descendant to fill his shoes, soon you have to neglect some areas to focus on the others. 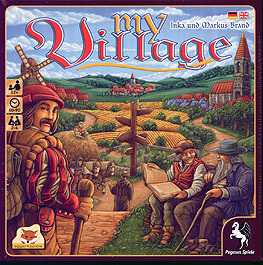 My Village is a stand-alone game that is set in the same cosmos as the award-winning Village. It joins familiar elements with fresh mechanisms and will enchant new players as well as experienced Village fans.